In this article entitled, “Homeless Tent Camps Belong Outside City Core,” The Olympian worries that the creation of two permanent houseless encampments that the city plans to move forward with in the coming months, each to have space for 40 individuals, will frighten away the yuppies that the newer luxury condominiums were created for. It doesn’t take much effort to see that these high end “dwelling units” and the houseless people who supposedly threaten the interests of downtown landlords and business people are dialectically entangled beyond the relation The Olympian imagines them to share. Elsewhere, the same newspaper recognizes an aspect of the actual relationship between houselessness and the encroachment of luxury condos in Olympia when it quotes a city employee who states, “’I think it’s fair to say homelessness grew . . . with West Coast rent increases.’” Houseless people are not a threat to landlords, they are the victims of landlords. What we’re seeing in Olympia is an example of how class warfare waged from above is a self perpetuating battle instead of one that can be decisively put to rest: coast-wide rent increases begets houselessness and the urgent need on the side of the capitalist class to conceal houselessness if it wants to create the kind of sanitized environment that encourages the well off to move in and start shopping. With the advent of large scale, centralized production in factories, bosses faced a similar dilemma: they were suddenly able to hoard more capital than they could possibly spend, but they had also placed a large number of workers who shared the same lot in daily contact with another, thus making industrial organizing not only possible but necessary for survival. Capitalism, because it is based on this manner of class war, cannot operate without breeding these crises. 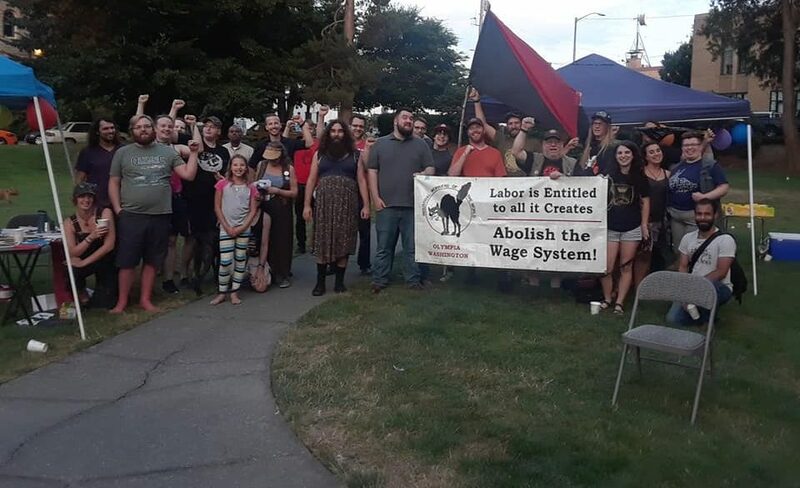 Furthermore, the bosses of the industrial era and the landlords and business owners of Olympia share a set of techniques to manage, on the one hand, houseless people, and on the other hand, industrial workers. You can find the police wherever mass strike action takes place and you can find them enforcing the criminalization of houseless people. Olympia Downtown Alliance has even hired a private security firm, Pacific Coast Security, to make sure the harassment never stops. At least there is some hope for eighty individuals who will benefit from the new permanent camps the city plans to create along with the Low Income Housing Institute, a Seattle-based non profit that owns over forty properties around the Puget Sound (including three in Thurston County, with one located in downtown Olympia) and manages tent and tiny house cities in Seattle. Sadly, however, we don’t need to do that much digging to unearth some dirt on the way LIHI runs other tent cities and its transitional housing program. While The Olympian wrings its hands over “activity catering to the destitute . . . in a business zone,” there’s nothing stopping LIHI from transforming transitional housing and tent cities into “business zones.” Unfortunately, it is difficult to find what most would refer to as a “reliable source” on the kind of organization LIHI really is. As one tenant of the LIHI-owned building in Olympia put it when I asked about their thoughts on the non-profit, “they’re just terrible … but when you come here you come here off the streets,” which makes it much less likely that tenants will speak up about unjust practices. A Facebook group called Victims of Seattle LIHI, however, calls the organization slumlords and accuses them of profiting off of the houseless and systematically evicting people without just cause from apartments originally built with the aid of the Low Income Housing Tax Credit which extends credit to developers with the caveat that they operate with rent caps in place, thereby subsidizing the creation of low income housing. These evictions, which are usually issued shortly before the lease on one of their apartment ends, not only allow LIHI to steal deposits but are also illegal since they are never accompanied by the “good cause” that the LIHTC program requires. A Seattle Solidarity Network campaign based on a LIHI deposit theft from 2012 also suggests this is not a new practice. It’s not just the deposit thefts, either. LIHI and an affiliated group, SHARE, have been accused of “misusing public money, illegally withholding bus tickets, and forcing the homeless into activism” over the course of their management of different tent cities in Seattle, according to a Seattle Times article entitled, “Homeless group’s tough tactics draw criticism.” You’ve got to wonder how non-profit the organization is when you hear that one of the tenants of the LIHI owned building in Olympia pays $600 in rent, only $40 of which was covered by the Department of Housing and Urban Development, or HUD. Another said LIHI refused to do repairs around the building and were not receptive to complaints regarding the way the building is managed. Though LIHI files its taxes as a non-profit, they nevertheless operate with the same motives and structures that all landlords share, only their tenants have even less power or social capital than your average renter. They own and control the spaces they rent, not the tenants. As the new permanent tent cities take shape in Olympia, we need to remember LIHI’s history, listen to the occupants, and be prepared to act in solidarity in any way we can.